This year, Volvo couldn’t be more excited to introduce its first compact crossover SUV—the 2019 Volvo XC40. And the Swedish carmaker isn’t pulling any punches either! As it stands, the Volvo XC40 promises to be one of the most comfortable CMAs you’ll ever ride in. So, if you’re ready to drive the ultimate luxury subcompact SUV, then join us as we explore the all-new 2019 Volvo XC40! This luxury crossover offers two different engine options. But both of these motors will offer a stellar and fantastic ride. The first is the base T4. This 2.0-liter 4-cylinder turbo motor offers front wheel drive with 187 horsepower and 221 lb-ft of torque. So there’s quite a bit of power resting beneath the hood of the subcompact SUV. The T5 ups the ante a bit. It’s still the same great motor as the T4, but with more punch in the performance. This time, you’ll get all wheel drive. You’ll also see a boost in power to allow for 240 hp and 221 lb-ft of torque. And the end result is a 0-60 in about 6 seconds. That’s just crazy for a luxury subcompact SUV! It’s not even trying to be a sports car, and yet the Volvo XC40 still packs more than enough power to get you where you need to go fast! And the fun doesn’t end with the performance. With 36 highway MPG (estimated) / 25 City MPG (estimated), 29 MPG - Combined (estimated), this is one of the most fuel-efficient CMAs you’ll ever drive. * And to help you keep your MPGs low, Volvo even includes an engine start/ stop feature. This allows you to save fuel when your car is not in motion. So you’ll definitely see some savings at the pump. Time to step inside the 2019 Volvo SC40! After all, this is a luxury subcompact SUV. So you know there’s some fun to be had here! Starting off in the back, you’ll notice the seats are quite spacious. In fact, tall passengers will have no problems fitting comfortably—they’ll even be able to stretch their legs a bit, which is always a sign of a great back seat. You’ll also get plenty of cargo too. Fold the seats down and the Volvo XC40 offers a full 47.2 cubic feet of space. To make this even better, Volvo even includes a reconfigurable cargo separator. In other words, organizing your luggage and goods just became easier. As far as the front seat goes, you’ll get a removable wastebasket. It seems minor at first. But after a few uses, you’ll wonder why this isn’t standard in all cars. 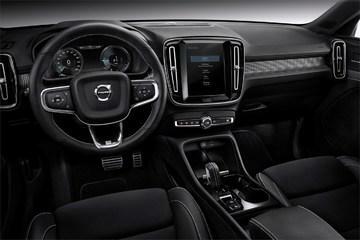 For infotainment, you’ll get the 9-inch Volvo Sensus touch screen. It’s easy to control and navigate. Plus, you’ll get access to Android Auto and Apple CarPlay. And if that’s not enough, this screen even controls quite a few of your car’s functions, such as lowering headrests. So this infotainment system adds plenty of fun and convenience to this luxury subcompact SUV. As expected from a luxury crossover, the 2019 Volvo XC40 offers some stellar safety options. To give you an idea, you’ll get blind spot monitoring, lane keeping assist, forward collision alerts and brakes, alongside pilot assist. In fact, there’s even a rear collision warning, which will preemptively tighten your seatbelt. So it goes without saying that the Volvo XC40 will do a great job of keeping you safe during your drives. If you’re curious about that car sharing service, Volvo offers the first four years as a standard feature. And Volvo On Call’s a pretty cool app that allows you to share your XC40 without needing to physically meet up. You’ll even drive and lock the car with the app, which makes it perfect when loaning it to friends and your teens. And lastly, you can opt for the R-Design. Here, you’ll get a sportier look with a contrasting roof color. And as an added bonus, you’ll get the fresh air woofer sound system that places a subwoofer under the windshield and in front of the dash. This helps free up some space in the door bins where speakers are usually placed. Either way you look at it, there’s plenty of fun and luxury to enjoy with the all-new 2019 Volvo XC40. 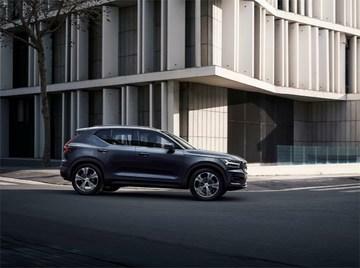 Get your 2019 Volvo XC40 Today! There’s no denying that the Volvo XC40 is undoubtedly one of the best luxury subcompact SUVs of the year. So don’t hesitate on getting yours! Contact the Wynn Group to see how you can drive your 2019 Volvo XC40 today!